Every month I share a resolution on the blog. I call it Just a Little Something. Keep up with it on my social media with the hashtag #JALS! I do these monthly challenges to prove that small changes can lead to a big difference. And doing a resolution for 30 days can possibly stick and form a great new habit. All you have to do is just something little, something small. So what's my resolution for this month? In light of April being Earth Month, I am choosing to make one healthy choice a day. For example, I take the stairs instead of the elevator. I bring my own bags to shop with instead of using plastic. But one of the easiest ways to do that is by switching to products from Tom's of Maine. 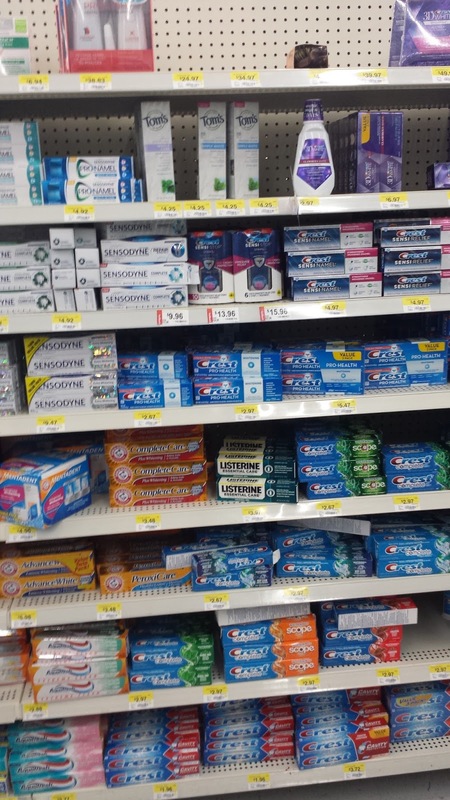 You can easily find Tom's of Maine at Walmart, in the health/personal care aisles. Are you familiar with Tom's of Maine? I'd heard of them, but since I don't lead a "crunchy" lifestyle, I didn't think they would be for me at first, but I'm glad they are a part of my daily routine now. I've been using them since last year, thanks to a suggestion by one of the little ones I nanny. She attends a school that is environmentally-focused, and is kinda obsessed with getting onto us about our habits. This includes making sure to not let the water run when brushing teeth, to make sure lights are off when exiting the room, and using the right products. She said I could only use Tom's of Maine, from then on, and well, I have to agree. So why do I continue to choose Tom's of Maine? Their natural personal care and oral care products are made with natural ingredients. I'm talking no artificial colors, flavors, fragrances, or preservatives. There are no artificial dyes or sweeteners. I've just started to make more eco-friendly choices, and I love how the products are cruelty-free and they don't have a negative environmental impact. Take a peek into my beauty room! It's an easy choice and an easy change. Changing the health and beauty products you use daily to ones like Tom's of Maine is a small change that can make a big difference. What small changes can you make? Click here to get $1.00 off any Tom's of Maine product purchase at Walmart. How was your weekend? Mine was very laid-back! I got caught up on shows I've not seen in ages and started some new ones. It was just what I needed. I'm also glad the pollen count went down from over 6000 to 642! Whew. I've have 4 giveaways going on! Be sure to scroll down, enter, and good luck! It's that time of year to ASK ME ANYTHING! It can be about me and/or beauty. I can't wait for your questions. 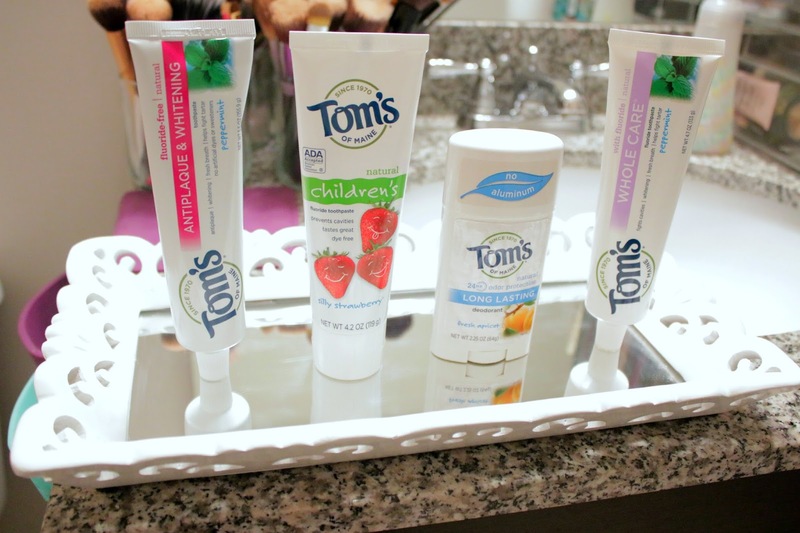 I love toms and use their deodorant religiously, I need to try the toothpaste as well, don't know why I waited so long. My sister uses this toothpaste and it is the best! I need to get some of my own! I've always wondered about these products but haven't tried them yet because I wasn't sure if they would work as well as the ones I've been using. I will have to give them a shot now! Their toothpaste looks awesome. I should pick up a few for my little one. Where do you want to go on vacation (if money were no object!)? I've never tried Tom's products but have always heard good things. Will need to check them out! I have so many shows to get caught up on! That sounds like a relaxing weekend! I am 99% always with a bag to shop at stores, but sometimes I forget. I hate the feeling, but then use the plastic bags at home for trash and stuff. I know it's just a lil something but I feel it helps the earth. I've heard of Toms of Maine but never used any of their products. Appreciate your review. I've never tried this brand before, because like you, I'm not really into the "crunchy" (love this word:D) lifestyle. Good to know we can get this at Walmart! I've never heard of Toms of Maine but their products sound awesome! I've been trying to be better about buying products that are more natural and have less artificial ingredients so I'll definitely have to check them out! There deodorant DID NOT work on me ;) haha! I'm so glad you love it though!! I love their products and cause! I love Tom's toothpaste. I stopped using it a while ago but I think I'll go pick some up! As for the deodorant..do you find it works and keeps you smelling nice all day? I've tried SO many natural deodorants that have left me smelly by the middle of the day (I don't even sweat that much!) so I finally just gave up and started using normal deodorant again. I might have to try this one, though. :) Hope you had a great weekend!! 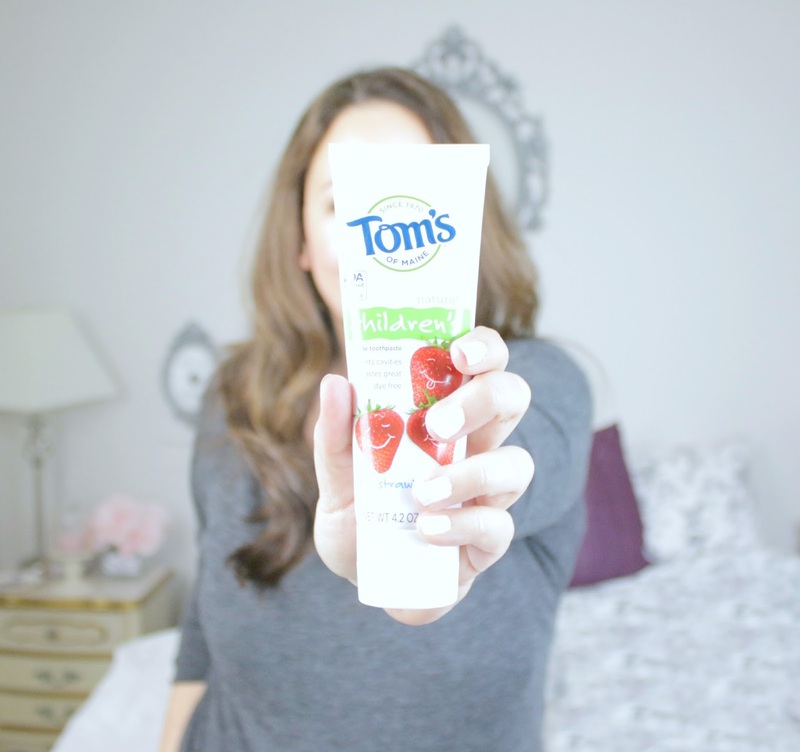 I love that Tom's is a natural and cruelty free product! I'm all for their products but I haven't tried their deodorant yet, I'm a little skeptical about it, not sure if it would last through the day. I have never heard of Toms of Maine before so this is a nice read. I'm starting to brush my little one's teeth too so will look if I can find these here. I love things that are more environment friendly & natural ingredients... but I'm worried if I could use it - I have UBER sensitive teeth & usually stick to Sensodyne. I'll have to see if they have a sensitive one to try. I def like the idea of using more environmentally friendly products. The apricot deodorant interests me. 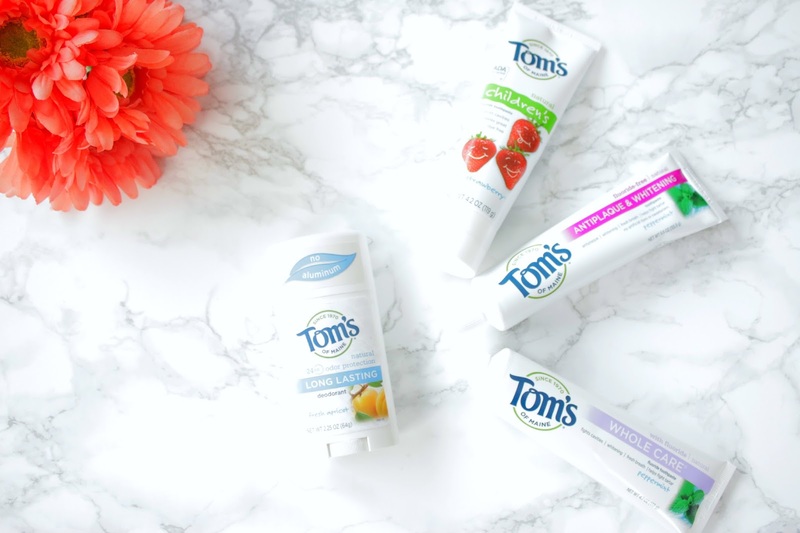 I'm planning to get the Tom's of Maine children's toothpaste for Jona--that's what his pediatrician suggested and I trust her. I should try it myself too! Glad you had a laid-back weekend! I have tried them once before as a sample. I do like that they are natural though I tend to gravitate to Colgate. Glad it was a nice relaxing weekend! Yes, another 5 year-old here wants that strawberry toothpaste! I think the products are very good, I like to think of protecting the world making sure ofting not let the water run when brushing my teeth and I always tell people not to do it. I also make sure lights are off when I leave a room... so I loved your post telling about healthy habits and products! I love Tom's of Maine products and have been using them for years. I can't however use the deodorant because it just doesn't work for me at all. I have heard a lot of great things about this product. Q~ I would love to know where do you see your self in 10 years? I've never heard of Tom's of Maine, but I'd definitely support a company that offers cruelty- free products. These products are amazing never heard of ... Thanks for this post!! I have been wanting to try their products but I use Sensodyne because my teeth are super sensitive. I wonder if they are sensitive friendly? Annnnd the deodorant scares me because I am a sweater. I hate it. But 2 minute outside in the summer here in the south and I am soaked. I gotta have something super strong at work. I wonder if theirs holds up? If nothing maybe I should try it in the fall when it cools down and I can take a risk haha. Your weekend sounds fabulous. I love a good tv show binge. My question would be if you could do any job (your dream job) and money doesn't matter...what would it be? And beauty related, what is your absolute favorite beauty product? Hope you have a great week! That apricot deodorant sounds so refreshing. I love making small changes like this. I want a more natural toothpaste, I've been using a free-from-bad-stuff deodorant and I want the same for my teef! i have never heard of toms before - i will have to have a look out at walgreens next time i'm there. so this might be a stupid question, but is there somewhere you can tell what the pollen count is? i'm confused. i didn't know that was a thing, that would be helpful with my allergies! i never had allergies till i moved here, so apologies if thats a silly question! I'm all for products with natural ingredients! I've never tried toms before but I've seen it around and a few people I know use it! Ive actually never tried Toms before but have heard really good things! I think I need to give it a go now! I'm so glad that Toms is a large enough company to be able to do campaigns like this now! There are tons of companies that make products with more responsible ingredients, but Toms is definitely leading the way! So happy to see this on your blog! I got a sample of their deodorant a few years back and it didn't work as well as I would have liked. How are you liking it? I need to pick up some toothpaste for sure!